Tonight’s Menu: On this show, we share our Shore Leave 40 interview with Micheal and Denise Okuda from the Star Trek Franchise. We also discuss upcoming fall shows, in particular, the Manifest, the Captain Marvel Trailer, the Bumblebee trailer, the new Star Trek Discovery shorts, and introduce the newest member of the SciFi Diner Crew, Chrissy. We end with Mile ranking the first six Star Trek movies. Special thanks to Lee Kemp who manages our Facebook page. Michael Okuda is an American graphic designer best known for his work on Star Trek. In the mid-1980s, he designed the look of animated computer displays for the USS Enterprise-A bridge in Star Trek IV: The Voyage Home. This led to a staff position on Star Trek: The Next Generation in 1987 as a scenic artist, adding detail to set designs and props. To The Next Generation, he contributed the GUI of the fictional LCARS computer system used throughout the USS Enterprise-D and other Starfleet starships. In homage to its creator, this visual style has come to be known among fans as “okudagrams”. Okuda also served as a technical consultant on the various TNG-era Star Trek series along with Rick Sternbach, advising the script-writers on the technology used throughout the Star Trek universe such as the transporters and the warp drive. This work resulted in a technical manual which was distributed to prospective script-writers along with the series bible. The manual was later published in revised and updated form as the Star Trek: The Next Generation Technical Manual by Pocket Books. Okuda then went on to write a number of Star Trek books with his wife, Denise. He continued working at Paramount Studios on the Star Trek series that followed The Next Generation, and worked as an art supervisor on Star Trek: Deep Space Nine, Star Trek: Voyager and through to the cancellation of Star Trek: Enterprise in 2005. He also worked on the Star Trek movies that were produced while the various television series were in production. He also served as one of the producers when CBS digitally remastered and updated special visual effects for the original series. As of 2011, Okuda remains involved creatively with the Star Trek franchise. He and Denise Okuda are serving as consultants on the project to upgrade Star Trek: The Next Generation to high definition. They also created the text commentaries in the ten Star Trek Special Edition DVD movies, as well as special text commentaries for the Star Trek Fan Collection sets. In 2005, Okuda contributed as a consultant for Perpetual Entertainment in their development of the MMORPG Star Trek Online. He also helped with the cataloging of items for the auction of Star Trek memorabilia by Christie’s auction house. The event, and the preparation for it, is included in the History Channel documentary film Star Trek: Beyond the Final Frontier. one of my rules regarding jokes was that they should never be apparent to the casual viewer. If they were, they would yank the viewer out of the story, and that would be a serious disservice to both. For this reason, I generally tried to keep the text on such gags at the ragged edge of legibility. Okuda designed logos for a number of NASA missions and programs including the STS-125 mission of Space Shuttle Atlantis to repair the Hubble Space Telescope and the Ares I-X development test flight. His work for Project Constellation subsequently canceled, included logos for the Ares booster, the Altair lunar lander, and the Orion spacecraft, designed to carry astronauts to the International Space Station and to return humans to the Moon. The Orion logo was unveiled on August 26, 2006. Okuda also designed a team emblem for the planned STS-400 rescue mission, which would have been launched if there had been a major problem during the STS-125 mission. For his work as the designer of many NASA mission patches, Okuda received the NASA Exceptional Public Service Medal. He was presented with the award at a ceremony at the Johnson Space Center in Houston, Texas on July 9, 2009. As of 2015, Okuda served as a visual consultant for the up-and-coming Firestorm pilot, a crowd-funded project set up by Jamie Anderson, son of Gerry Anderson, creator of Thunderbirds. Firestorm is to utilize advances in animatronic marionettes, props and miniature set design dubbed ‘Ultramarionation’. 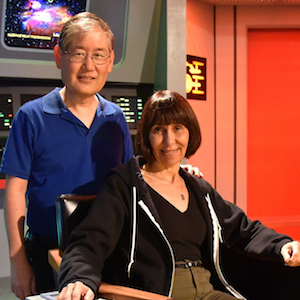 Denise Lynn Okuda is a computer, scenic and video supervisor, and a writer known for her work on several Star Trek film and television productions, as well as other science fiction television. She also co-authored the Star Trek Encyclopedia and the Star Trek Chronology. Okuda currently serves as a consultant to CBS on the project to upgrade Star Trek: The Next Generation to high definition. She previously served as a producer for visual effects for CBS Paramount’s remastered version of the original Star Trek series. Okuda’s credits also include Star Trek: Enterprise, Star Trek: Deep Space Nine, Star Trek: Voyager, and four Star Trek movies. Working with her husband, Michael, Denise wrote trivia text commentaries for the ten Star Trek Special Edition DVD movies, as well as special text commentaries for the Star Trek Fan Collection sets. Her other production credits include the pilot episode of Threshold and the TV series version of The Flash. Okuda was a cataloguer for the auction of Star Trek memorabilia by Christie’s auction house in 2006. She was interviewed on her work for the project in the History Channel documentary Star Trek: Beyond the Final Frontier.